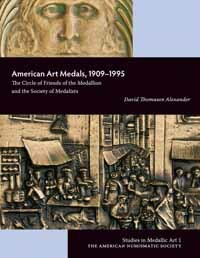 American Art Medals, 1909–1995 is the first comprehensive study of the two most important series of art medals produced in the United States: the medals of the Circle of Friends of the Medallion (1909–1915) and those of the Society of Medalists (1930–1995). Together, these two series offer an unmatched panorama of American medallic sculpture in the twentieth century. Founded by the art writer Charles de Kay and the collector Robert Hewitt, Jr., the Circle of Friends of the Medallion issued only twelve medals in its brief existence. Occurring, however, at a time when the Beaux-Arts movement had brought medallic art to a higher prominence among sculptors than it has enjoyed before or since, the series is of great significance for the development of the American art medal. The Society of Medalists, during its life of sixty-six years, produced a much more extensive series: 128 regular issues (one of which includes six separate pieces), as well as four special issues designed for the Society (and one other special issue of an already existing medal). This body of work showcases the development of diverse artistic styles among figurative sculptors of the twentieth century, from classicism to modernism. The 123 sculptors whose work was presented in this series include almost every major American medalist of the era as well as several notable artists from other countries. In addition to cataloguing the issues of these two medallic art organizations, this book features an innovative effort to record the different colors and patinas in which the medals were issued. Especially for the Society of Medalists, whose long history meant that different production batches of a particular medal might have been made several decades apart, this hitherto neglected dimension in the study of art medals shows how changes in the surface finish can yield truly startling variations in the visual impact of a design.